I love Luaus. Besides the beautiful Hula Dancing, my favorite attraction at every Luau is the Imu Ceremony. During the Imu Ceremony, a few buff Islanders present the slow roasted pig from a traditional underground oven called an Imu. The crowd claps, cheers, and goes crazy when they see a smoking pig unearthed from the ground. At this point, hungry Luau goers return to their seats and patiently wait for their table to be called up to the buffet line to begin filling up their plates. There are tons of food options at a Luau, but the most popular item is probably the Slow Roasted Kalua Pig. The pork is fork tender, shredded similar to carnitas or pulled pork, and despite only seasoned with only a few ingredients, it is ridiculously flavorful. This recipe is inspired by the Kalua Pork at Luaus in Hawaii. I wanted to replicate and make my Kalua Pork as authentic as possible. 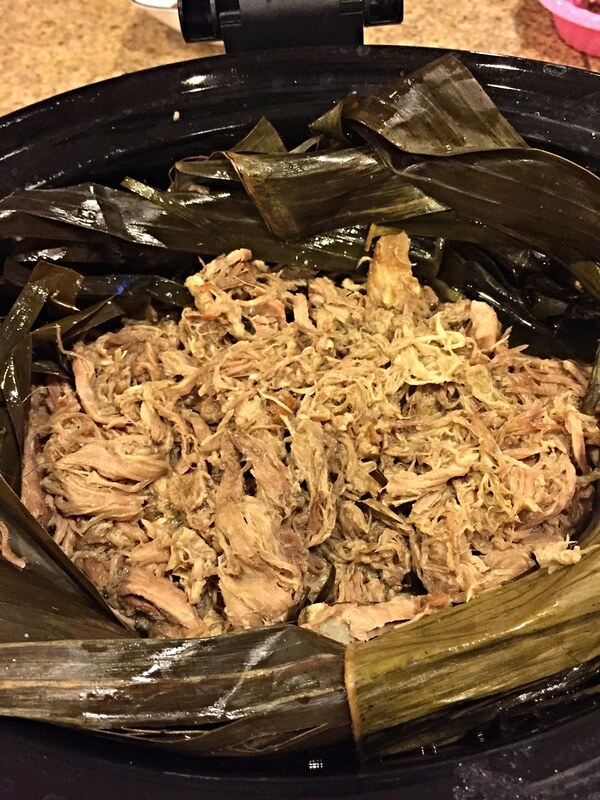 I found that using liquid smoke and banana leaves impart a distinct earthy and smoky flavor in the pork and mimics the Luau slow roasted Kalua pork perfectly. I’ve made these for many parties over the last few years and it is definitely a crowd-pleaser. Traditionally, The Hawaiian Kalua Pork is served with rice and macaroni salad, but the left overs are great in ramen, sandwiches, Mexican dishes, and even a healthy salad. Tip: For every pound of pork, I use 1 teaspoon of Hawaiian Sea Salt. Pierce holes in the pork with a fork or knife. Season pork with Hawaiian sea salt and liquid smoke. Leave refrigerated for a 3-4 hours, preferably over night. Wrap the pork securely with the banana leaves. on low for 12 hours. Cut banana leaf and shred pork a thong or fork. Add shredded cabbage and mix well. I use 1 teaspoon of salt for every pound of pork. If you do not have Hawaiian Sea Salt, use a coarse salt, like kosher or sea salt. Although the cabbage is optional, I would recommend adding it for additional texture and flavor.